RELIABLE SECURITY AND BEST PRICE? OCTOPUS offers ship managers the opportunity to book vetted, top tier security services for their transits online. The platform provides a streamlined service where ship managers can select and hire certified PMSCs of their choice via a private and secure bidding process. 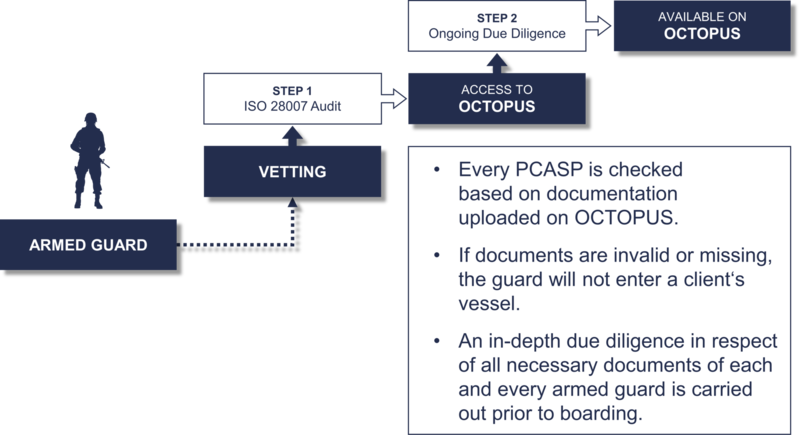 Using OCTOPUS, ship managers can be certain to choose only highly qualified armed guards whilst enjoying the benefit of price transparency. Marine Risk & Quality (Gesellschaft für maritime Risikobewertung und Qualitätsbemessung mbH) was founded in 2012 as a subsidiary of Lampe & Schwartze Marine Underwriting with its headquarters in Bremen. On the basis of our traditional mother company, which was founded in 1858, we have many years of experience and a world-wide network in the field of shipping and insurance at our disposal.